Pregnancy must-haves for mummies of multiples, from soothing aches and pains to being in-the-know…. I read a lot of books when I was pregnant with one baby. But I’ve read a lot less now I’m pregnant with two babies….. However, the ones I have read, I’ve found to be really invaluable. Second time around you tend to know what your needs are and what things it helps for you to focus on. I’m quite an academic sort of person, for me, knowledge is power, and so when a new situation comes along – like discovering you’re having twins – I’ve found it helpful to read around my ‘subject’, so I feel informed. I also think it is important to take responsibility for your own health. It’s not that I don’t trust doctors, simply that I believe in being responsible with your body, with knowing your limits and being educated about what’s best for you and your health, and in this case, for your babies. So I stayed away from the likes of ‘HELP – It’s TWINS!!! HOW TO SURVIVE!! !” and other idiotically titled books that seemed to make a joke of the situation without imparting any useful wisdom – and focused instead on the health, science and practical aspects of being pregnant with twins, and then having and looking after twins, that I needed, and wanted, to know about. 1) When You’re Expecting Twins, Triplets or Quads: This was recommended to me by a friend of a friend in Australia and I couldn’t be more thrilled with it. A really practical book, that deals with all aspects of a twin (and beyond) pregnancy, filled with important information about the different types of twins, what to expect from your pregnancy, increased risk factors and how to manage them, and crucially, how to eat well when you are eating for three. I read most of this book from cover to cover early on, and have dipped back into it throughout this pregnancy, just to check or clarify on something. Written by three experts with different experiences of twin pregnancies, either personal ones of through their professional lives, this is a balanced book and a mine of brilliant information. 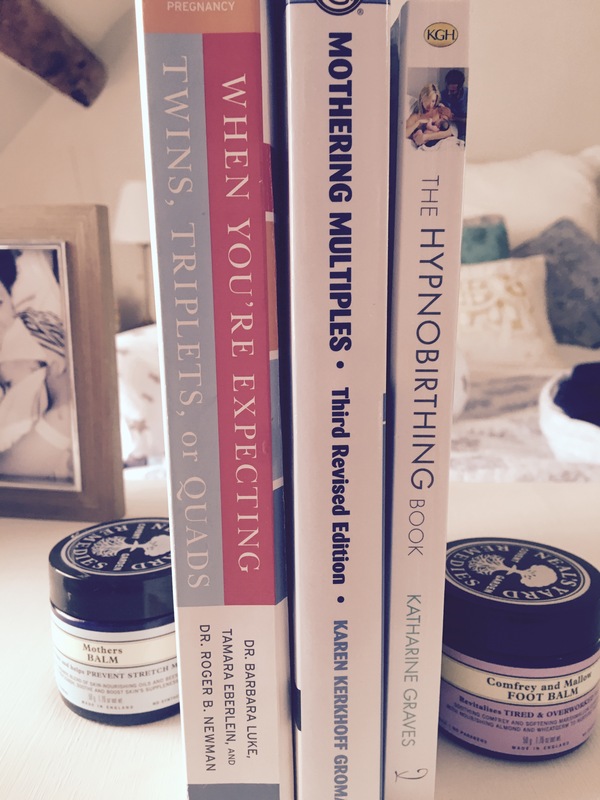 3) The Hypnobirthing Book: This is is the best hypnobirthing book I’ve read, and is part of the great hypnobirthing course I did recently. A practical guide to preparing your mind and body for birth – it has great breathing and meditation scripts for you to read and practise as well as a straight-forward approach to the different ways hypnobirthing can work for you. I got NO stretch marks with Munchkin. Not a one. But this pregnancy is a whole different ballgame. 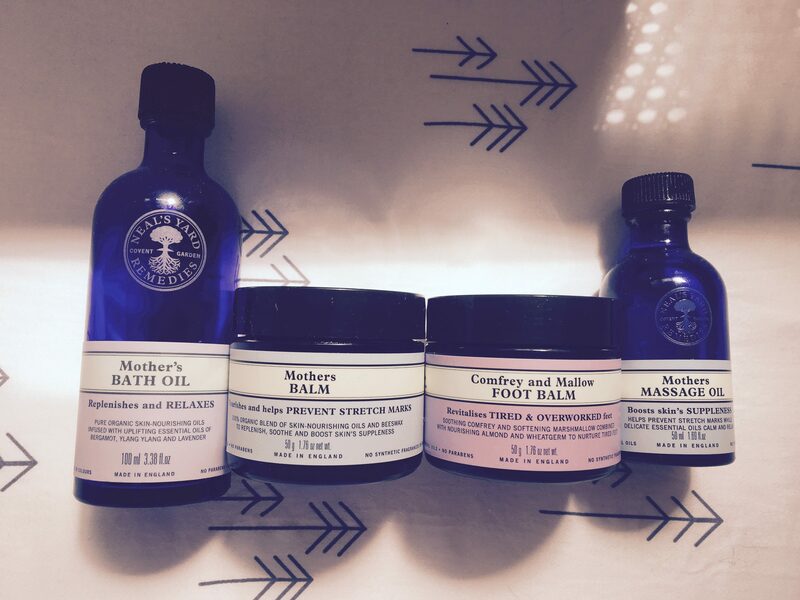 When it comes to brilliant products for pregnancy I don’t think you can do better than Neals Yard – this isn’t an ad, I don’t work for them, I just rate their products, especially for mothers and babies. They’re natural, organic, ethical and have a considerable range targeted at pregnant women. They’re also some of the only people I know that make bath soaks for pregnant women using essential oils. These are the four things I couldn’t live without. Foot Balm: a gift from a friend when I didn’t even know I needed it, I make R rub this on my feet every evening and it’s MAGIC. Soothing, calming, refreshing, it even helps me sleep better. Mother’s Massage Oil: I use this on my bump in the evening for a lovely scented salve, and it’s lovely for rubbing into hands, feet and shoulders too. Of course social media is also a great place to go for inspiration and positive affirmations. I have stayed away from a lot of the more commercial twin sites and accounts, and focused instead mostly on people who have twins and the great pearls of wisdom they share. Fox Fairy Twins: Celebrating a year with her twins, this is a great feed for anyone expecting twins, a really natural, approachable, honest feed dealing with all aspects of twin life. Mum of Twin Twins: This awesome human is a mama to twins TWICE. So she pretty much has all the advice I need. And all the respect. Twin Love Concierge: A lovely little account promoting breastfeeding and healthy twin pregnancies, with a UK and US focus. 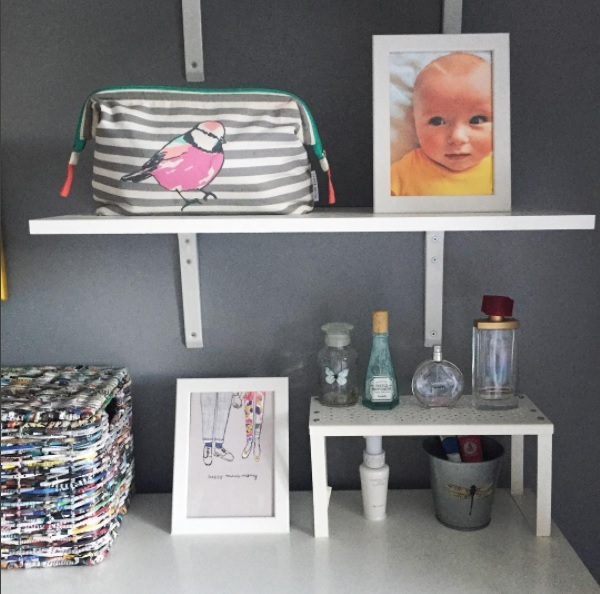 Stuff 4 Multiples: Great resource for unique products targeted at twin or more parents. Breastfeeding Twins UK: A vital page for anyone wanting to breastfeed twins, the advice and support from the online community is invaluable. TAMBA: Twin and Multiple Birth Assocation, follow on Insta and Facebook for official twin information.